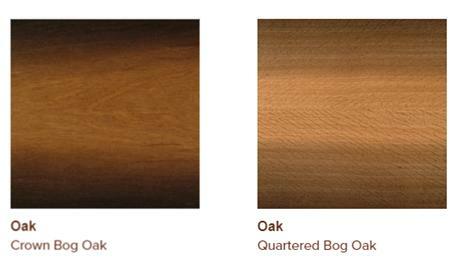 Oak is known as the king of the forest, and when it comes to natural wood veneers, it surely must hold the same title, with so many oak veneers choices and stunning finishes to catch the eye. 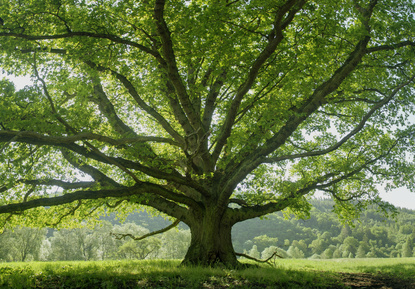 With its long lifespan, the oak tree has come to be considered a national symbol of strength and survival and plays an important role in English culture. The Christmas Yule Log was traditionally cut from the oak tree. Through history, kings would wear oak leaf crowns and numerous organisations across the globe utilise the oak leaf as an emblem to signify environmental harmony, including the Woodland Trust. Oak is used extensively in joinery and furniture making. It produces an incredibly strong timber and, with so many species of oak to choose form, it also offers a superb range of striking finishes to suit any taste. 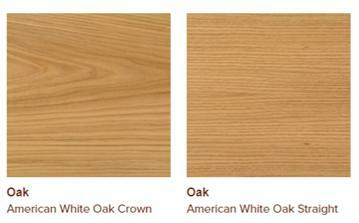 Our veneers A-Z presents as many as TWENTY different options when it comes to oak veneers. Bog oak is not a specific species, but a term describing oak that has been buried in a peat bog for hundreds or sometimes thousands of years. The timber is protected from decay by the low oxygen concentrations and the peat provides an acidic base, allowing minerals and salts to react with the tannins in the wood, leading to a distinctive dark brownish black finish. When crown cut, this oak veneer presents a smooth, chocolate-like effect. When quarter cut, there is a distinct fishbone effect running through the grain producing a very eye-catching finish. Like bog oak, brown oak is not a specific species but usually English or European oak that has been infected with a fungus, Fistulina hepatica. This fungus transforms the wood into a deep brown colour. The wood when cut and dried, with the fungus dead, ends up a rich golden brown colour. As with bog oak, demand is high so you can expect to pay a premium for brown oak veneers. However, the finish really is something spectacular and unique. Brown oak burr in particular is something to behold, and tiger brown oak burr is particularly rare and unique presenting as a warm chocolate brown with glimmering gold mottle. The ‘tiger stripes’ appear as the brown flows up from the roots towards the crown of the tree. If you are seeking something really special for your premium joinery creations, brown oak could be the very thing. European oak is also known as English oak (Quercus robur). 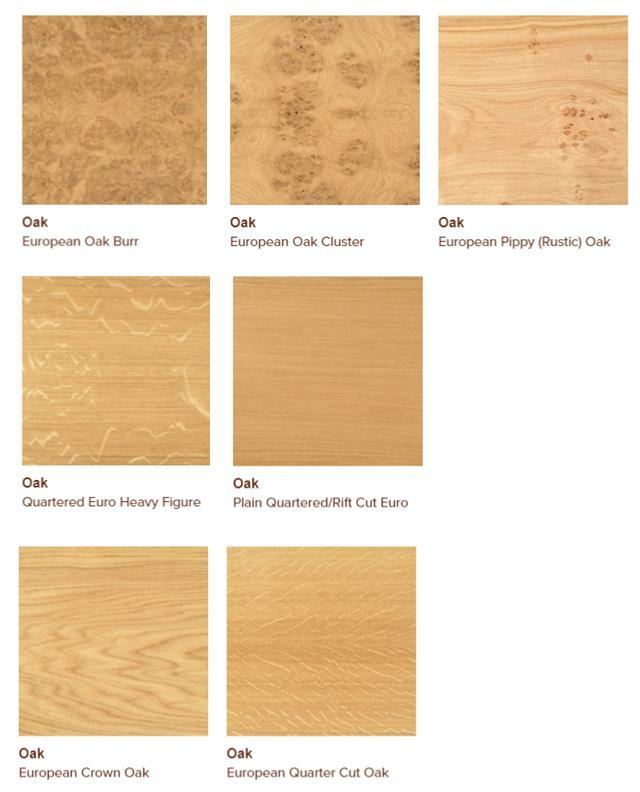 When it comes to European oak veneers, there is a fair amount of choice, including oak burr, oak cluster, pippy or rustic oak with its lovely spotted features, plus figured and rift cut. Red oak, Quercus rubra, was introduced to the UK from America. It is primarily grown as an ornamental tree in parks and gardens and much admired for its beautiful autumn colour. Red oak was widely used as a forest tree in Europe in the 19th century and in Britain after 1920. American White Oak (Quercus alba) is generally produced from a smaller log than European oak and is less durable. Nevertheless, it remains popular for interior joinery, cabinetry and bespoke high end kitchens. This is a timber that tends to vary in colour, from a pale yellowish-brown through to reddish-brown, usually with a hint of pink. The grain is generally straight with silvery rays and the texture coarse to medium coarse. The quality depends on growing conditions which is the same for American red oak. Fumed oak, also known as smoked oak, is oak that has been treated with ammonia to change its colour. The oak is enclosed into a sealed environment where the ammonia causes a reaction within the wood. The tannins are brought to the surface, provoking a darkening effect. The longer the exposure to the ammonia, the darker the wood becomes. 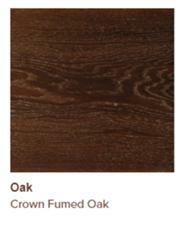 Fumed oak veneer range from a rich brown shade to almost black. If you would like to learn more about the art of wood and joinery crafting with oak veneers, you are welcome to get in touch for tailored advice. We offer an extensive range of oak veneers, so why not talk to us about your individual project?